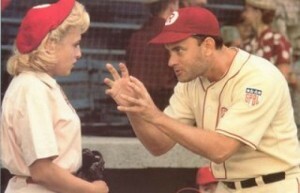 According to Jimmy Dugan, "There's no crying in baseball!" According to the American Film Institute, their list of top 100 movie quotes of all time includes (at number 54), “There’s no crying in baseball!” This gem, uttered in “A League of Their Own” by Peaches coach Jimmy Dugan (played by Tom Hanks) has also become a favorite of sportscasters and fans alike. Apparently, few of the players currently on postseason rosters have yet to see this very entertaining and informative film. First, Cole Hamels. Last year’s World Series MVP really wants to get back to the big show again this year. In the process, he’s annoyed about the afternoon game times that the Phillies/Rockies matchup has garnered this week.